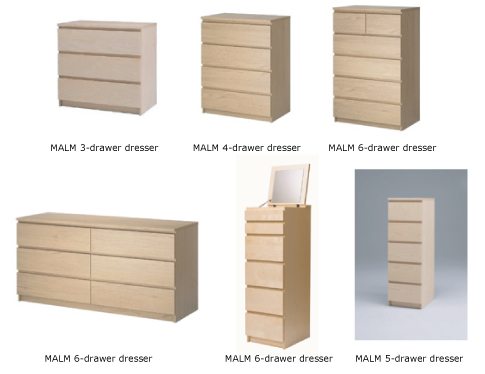 The products being recalled include six models of MALM chests or dressers made between the years 2002-2016, and around 100 other families of these pieces. All of the deaths involved dressers or chests that were not secured to the wall. This is also not the first time the Swedish furniture retailer has dealt with this type of issue. From 1989 to 2007, 41 tip-overs of non-MALM pieces caused 19 injuries and three deaths. CPSC & IKEA announced the joint recall of the 29 million pieces and encourages families with small children to install furniture anchors to all furniture throughout their home, regardless of the manufacturer. If you want to keep the product, call IKEA for a free anchoring kit and anchor it yourself. If you wish to get rid of the product but don’t have the means of transporting it to your nearest IKEA, call IKEA and they will come to your home and remove the product free of charge. If you wish to keep the product but you aren’t able to anchor a chest or dresser yourself, call IKEA and they will come to your home to install an anchor free of charge. If you or someone you know own one of the products from the recall, you can contact IKEA at 1-866-856-4532 or email: secureit@ikea.com to discuss how to participate in the recall. Additionally, if someone has been injured by one of these products, contact us today for a free consultation to see how we can help you get the legal help you deserve.